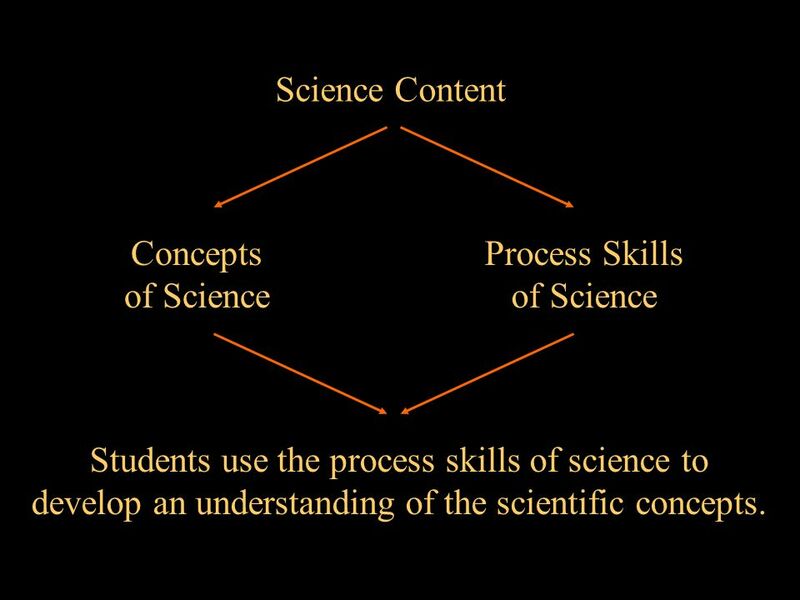 Science Content Concepts of Science Process Skills of Science Students use the process skills of science to develop an understanding of the scientific concepts. 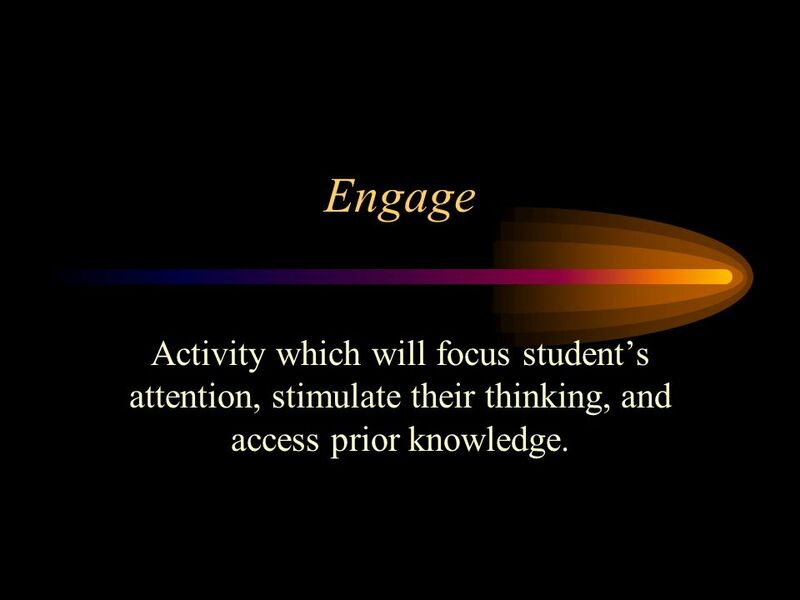 4 Engage Activity which will focus student’s attention, stimulate their thinking, and access prior knowledge. 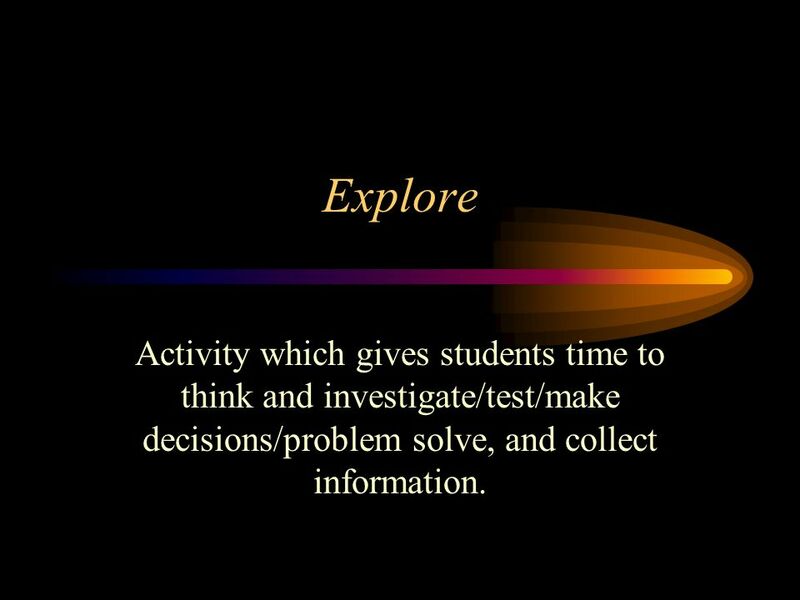 5 Explore Activity which gives students time to think and investigate/test/make decisions/problem solve, and collect information. 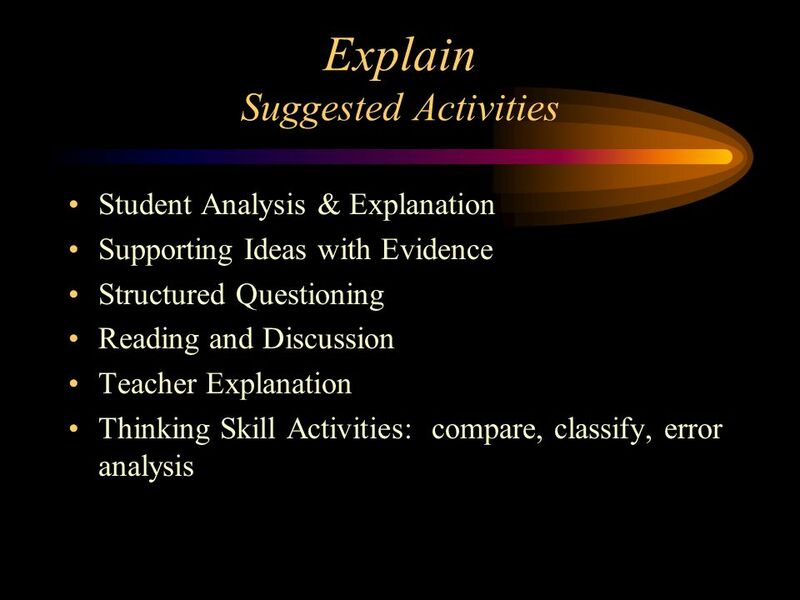 6 Explain Activity which allows students to analyze their exploration. 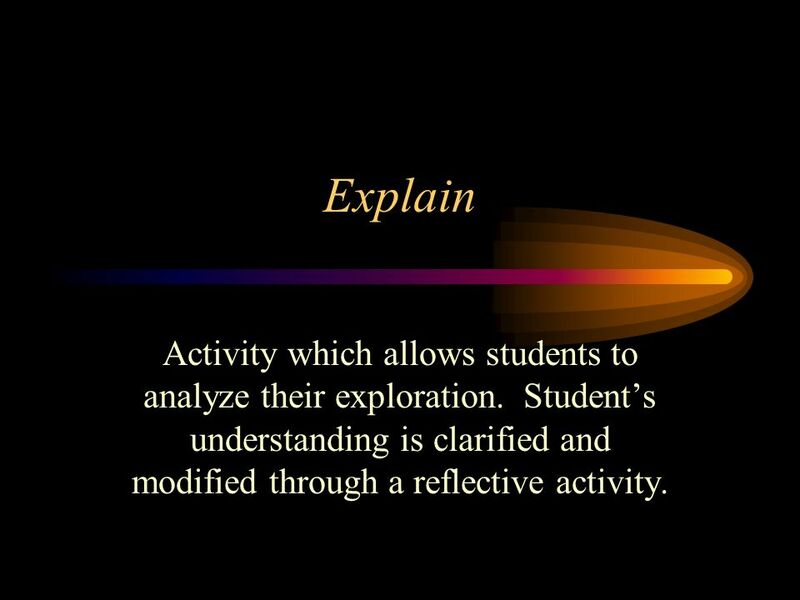 Student’s understanding is clarified and modified through a reflective activity. 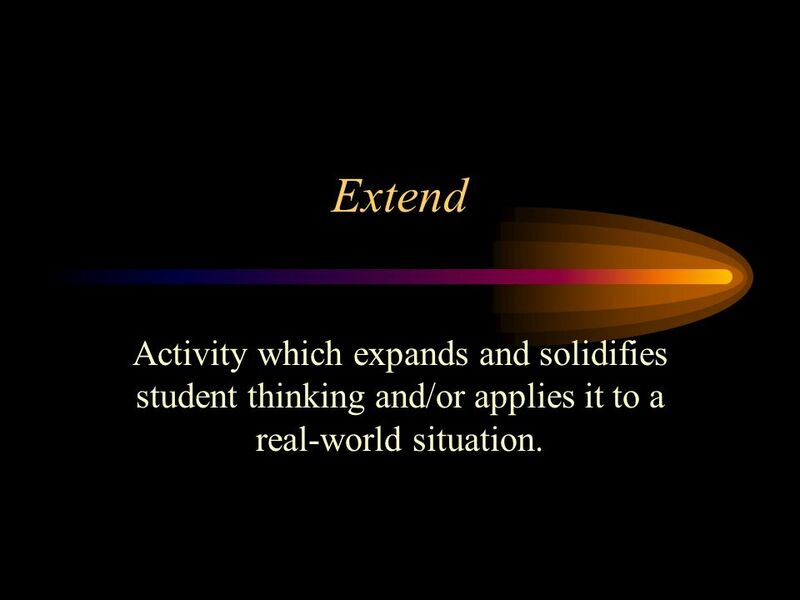 7 Extend Activity which expands and solidifies student thinking and/or applies it to a real-world situation. 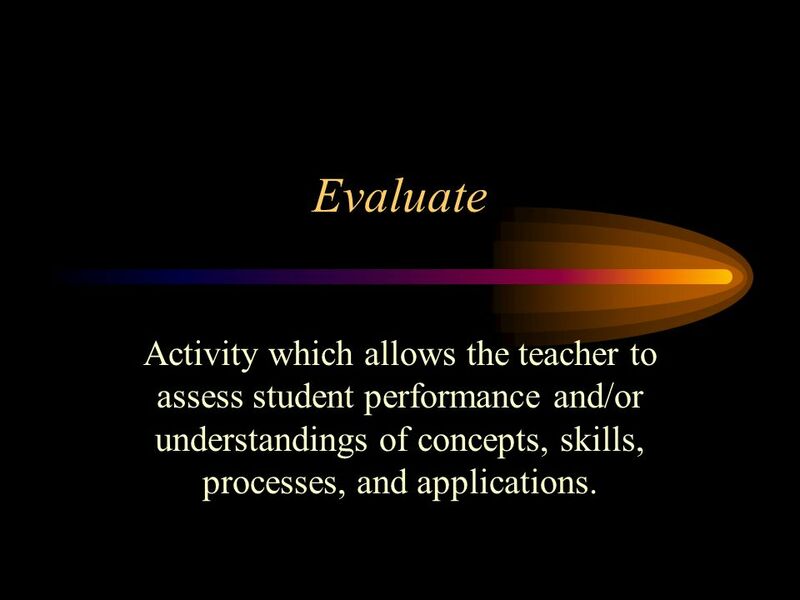 8 Evaluate Activity which allows the teacher to assess student performance and/or understandings of concepts, skills, processes, and applications. Creates Interest. Generates curiosity. Raises questions. 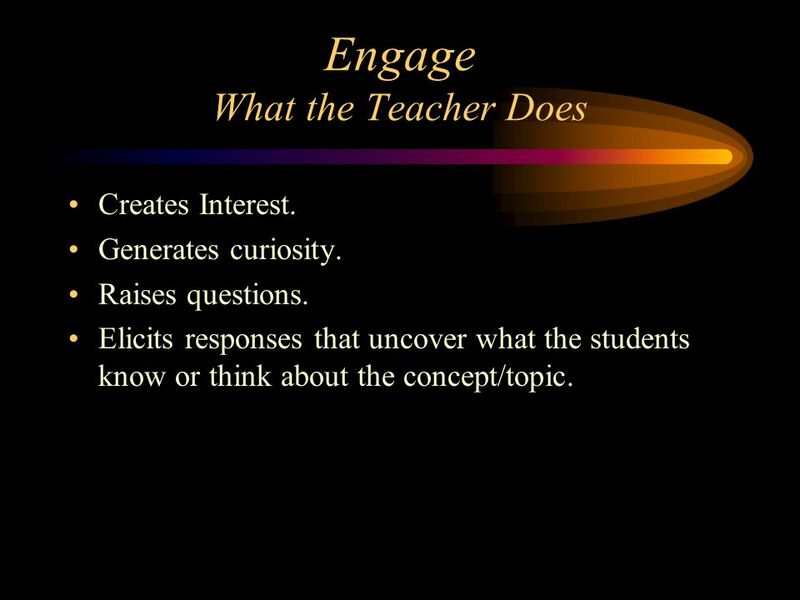 Elicits responses that uncover what the students know or think about the concept/topic. Asks questions such as, Why did this happen? What do I already know about this? What have I found out about this? Shows interest in the topic. 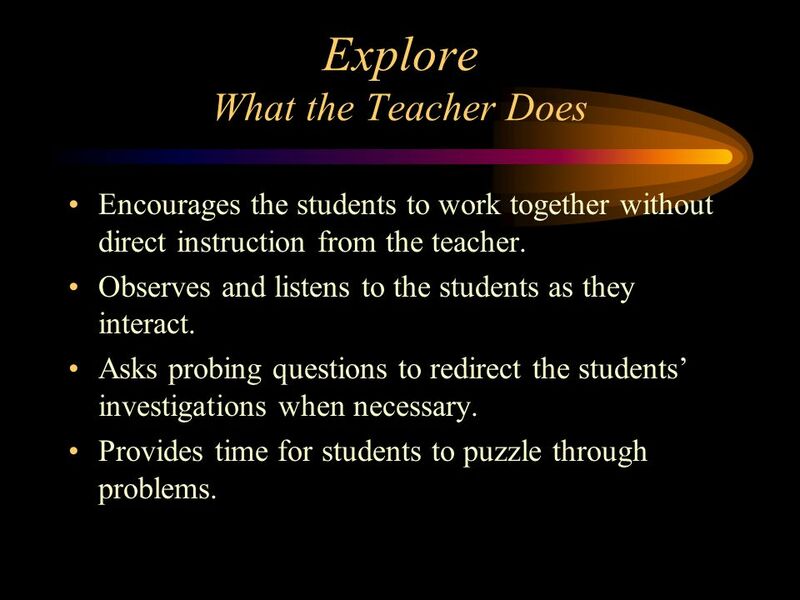 Encourages the students to work together without direct instruction from the teacher. Observes and listens to the students as they interact. Asks probing questions to redirect the students’ investigations when necessary. Provides time for students to puzzle through problems. Thinks freely but within the limits of the activity. Tests predictions and hypotheses. Forms new predictions and hypotheses. Tries alternatives and discusses them with others. Records observations and ideas. Suspends judgement. 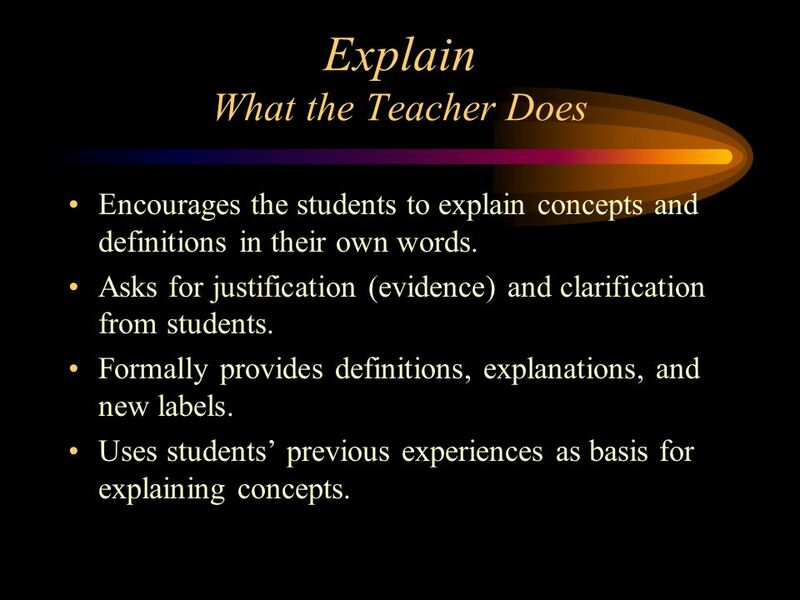 Encourages the students to explain concepts and definitions in their own words. Asks for justification (evidence) and clarification from students. Formally provides definitions, explanations, and new labels. 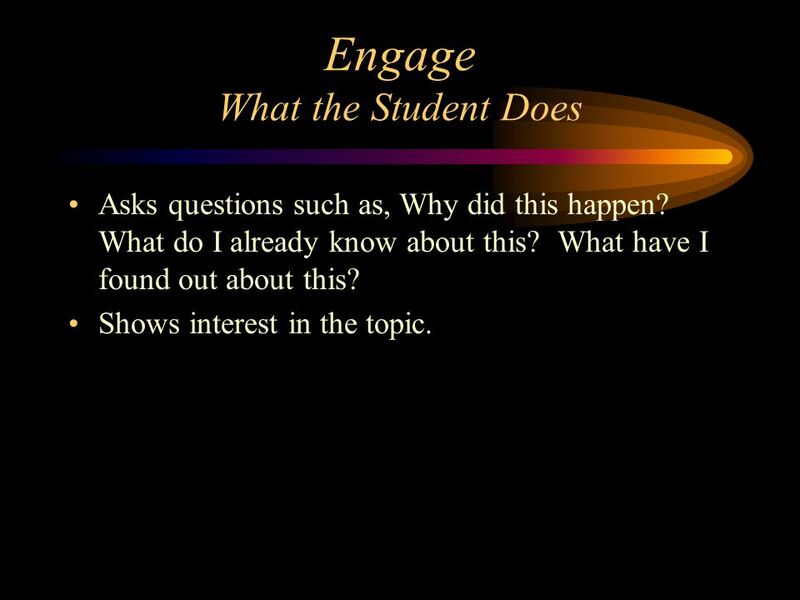 Uses students’ previous experiences as basis for explaining concepts. Explains possible solutions or answers to others. Listens officially to others’ explanations. Questions others’ explanations. Listens to and tries to comprehend explanations the teacher offers. Refers to previous activities. 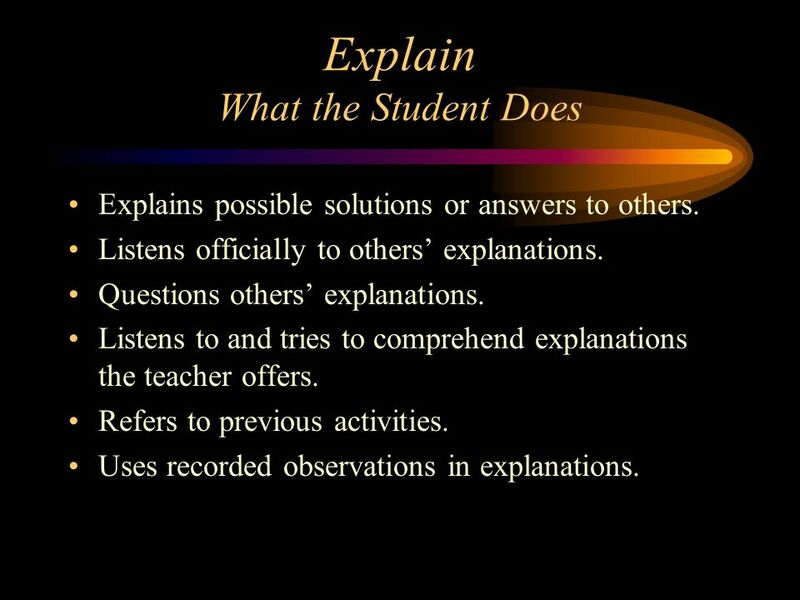 Uses recorded observations in explanations. 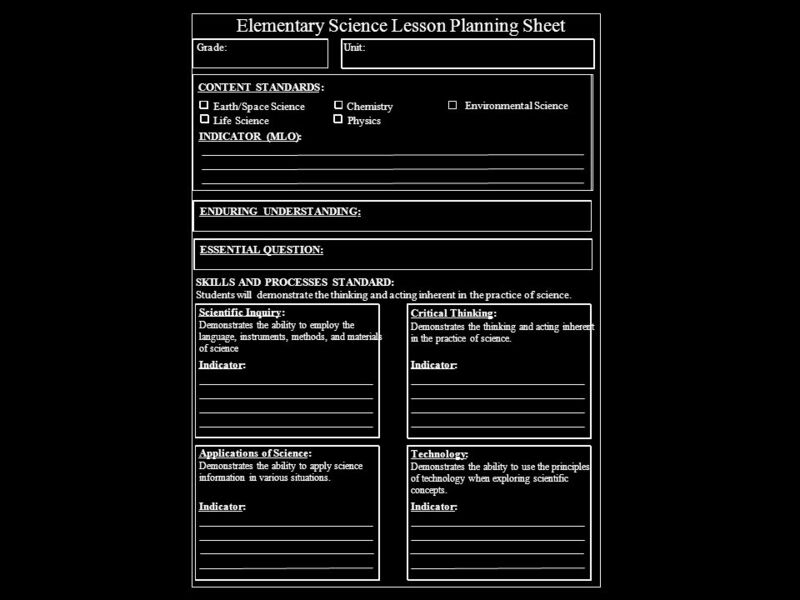 Expects the students to use formal labels, definitions, and explanations provided previously. 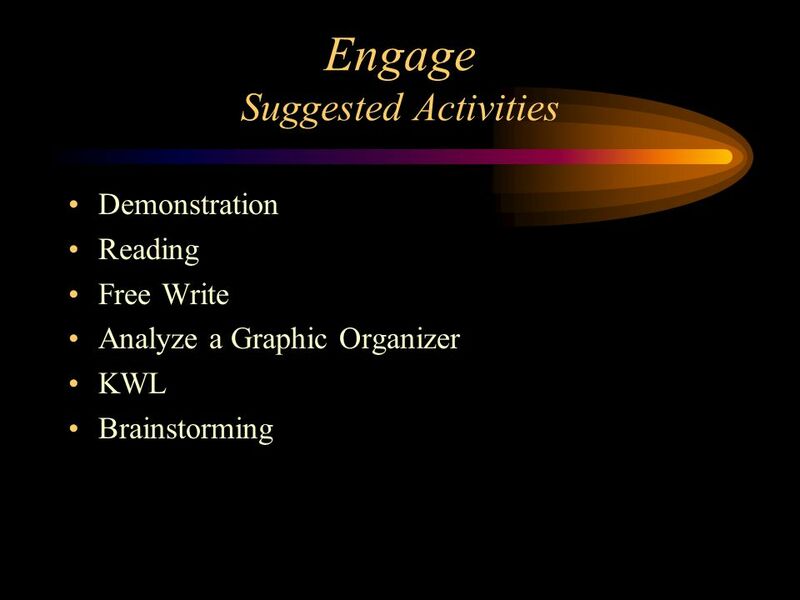 Encourages the students to apply or extend the concepts and skills in new situations. Reminds the students of alternative explanations. 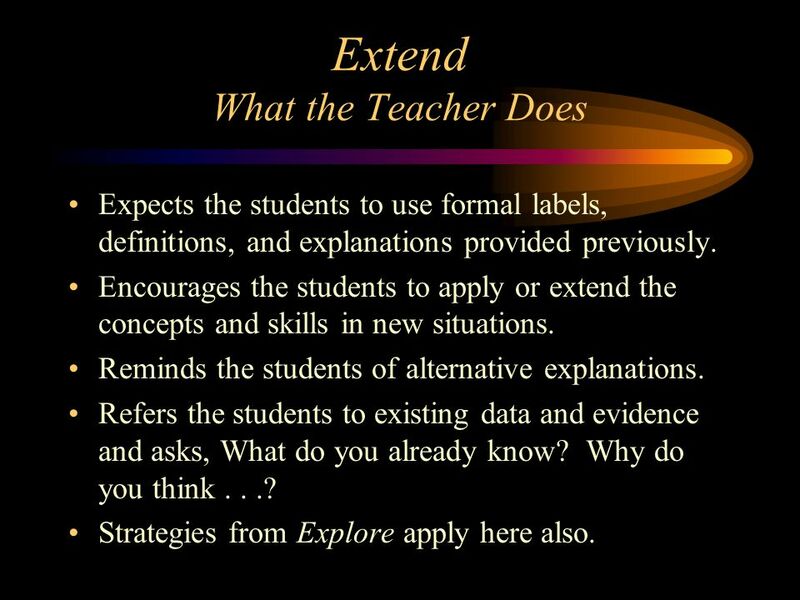 Refers the students to existing data and evidence and asks, What do you already know? Why do you think . . .? Strategies from Explore apply here also. Applies new labels, definitions, explanations, and skills in new, but similar situations. 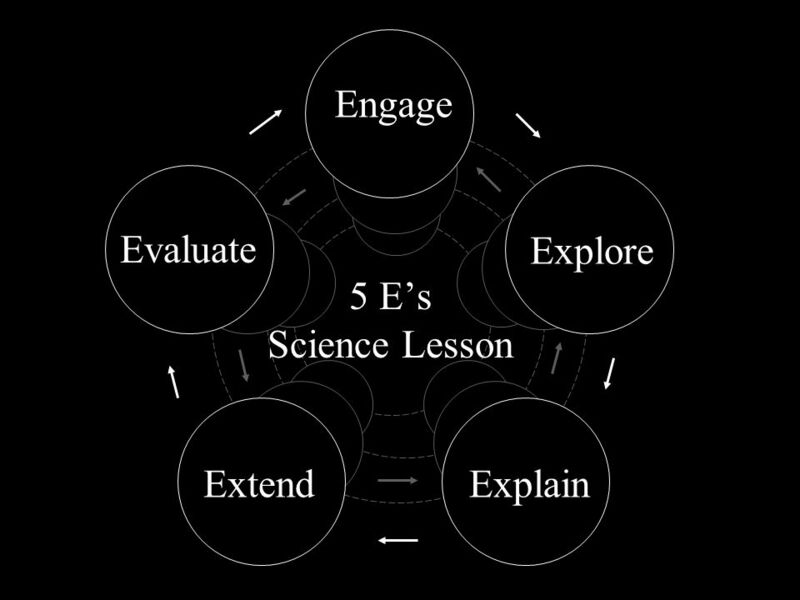 Uses previous information to ask questions, propose solutions, make decisions, and design experiments. Draws reasonable conclusions from evidence. Records observations and explanations. Checks for understandings among peers. Observes the students as they apply new concepts and skills. 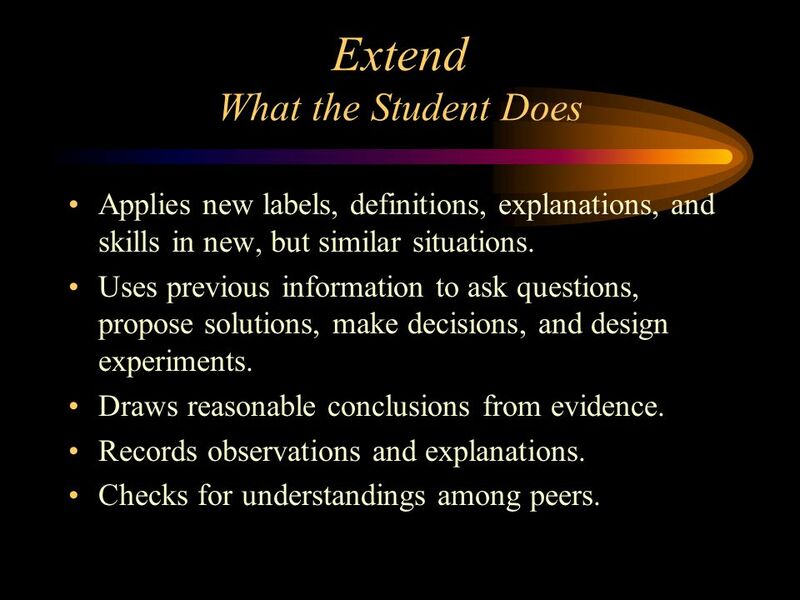 Assesses students’ knowledge and/or skills. 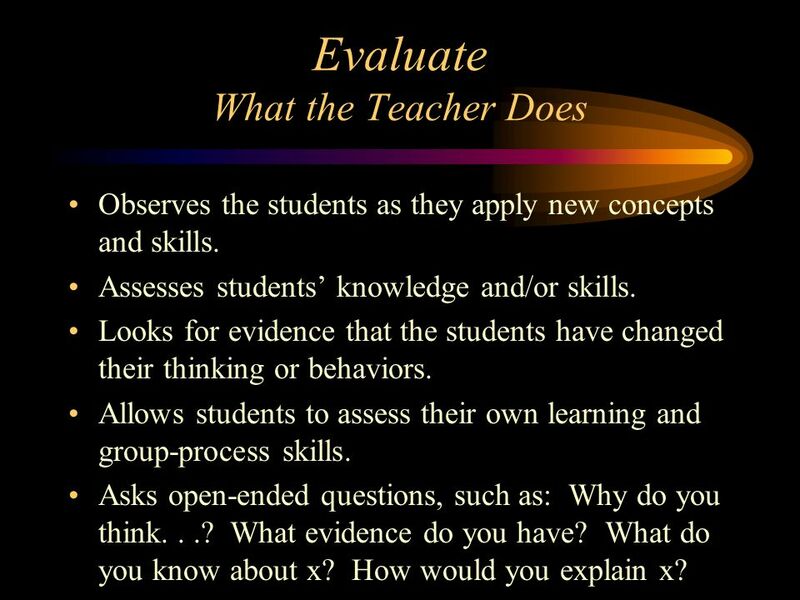 Looks for evidence that the students have changed their thinking or behaviors. 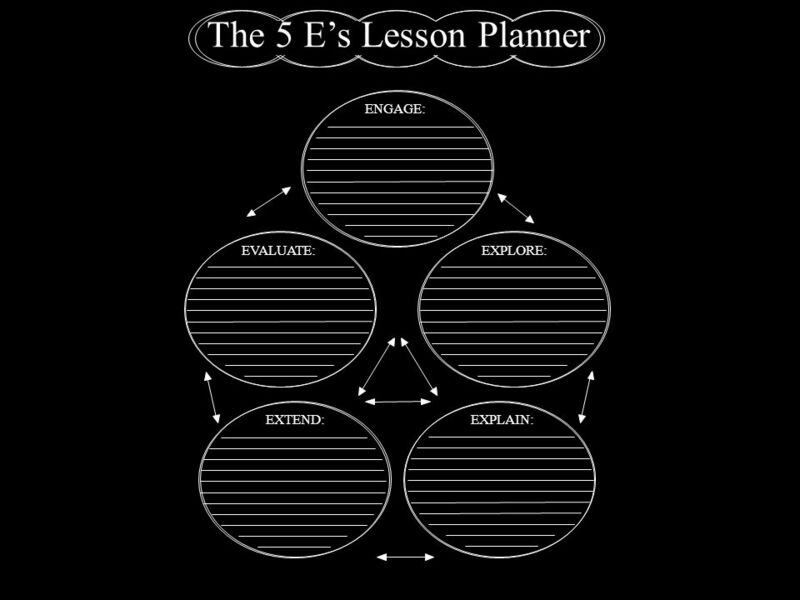 Allows students to assess their own learning and group-process skills. Asks open-ended questions, such as: Why do you think. . .? What evidence do you have? What do you know about x? How would you explain x? Answers open-ended questions by using observations, evidence, and previously accepted explanations. Demonstrates an understanding or knowledge of the concept or skill. 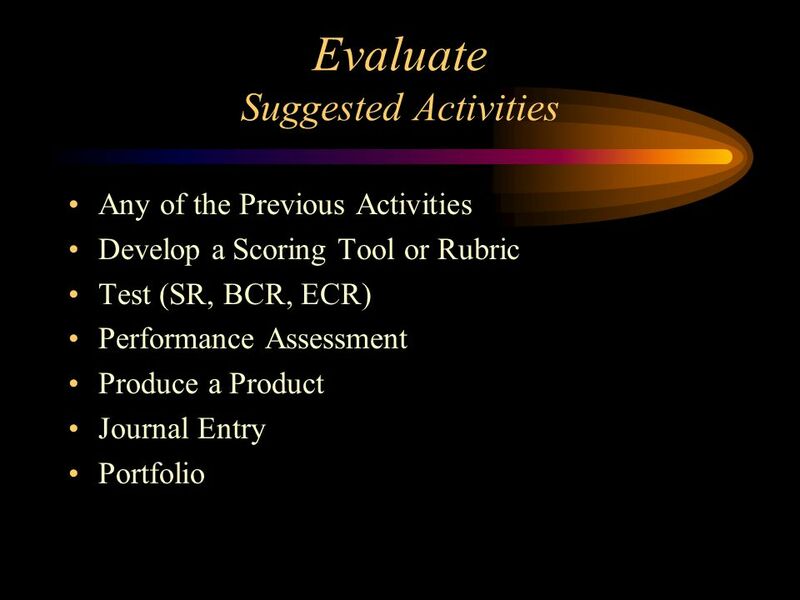 Evaluates his or her own progress and knowledge. Asks related questions that would encourage future investigations. High School Part 1 Testable Question(s) - A question that can be answered through an investigation. Prediction - A statement about what may happen in the investigation based on prior knowledge and/or evidence from previous investigations. Hypothesis - A testable explanation (if-then statement) based on an observation, experience, or scientific reason including the expected cause and effect in a given circumstance or situation. Well-Designed Procedure Directions - A logical set of steps followed while completing the procedure. Materials - All materials needed for completing the investigation are listed. 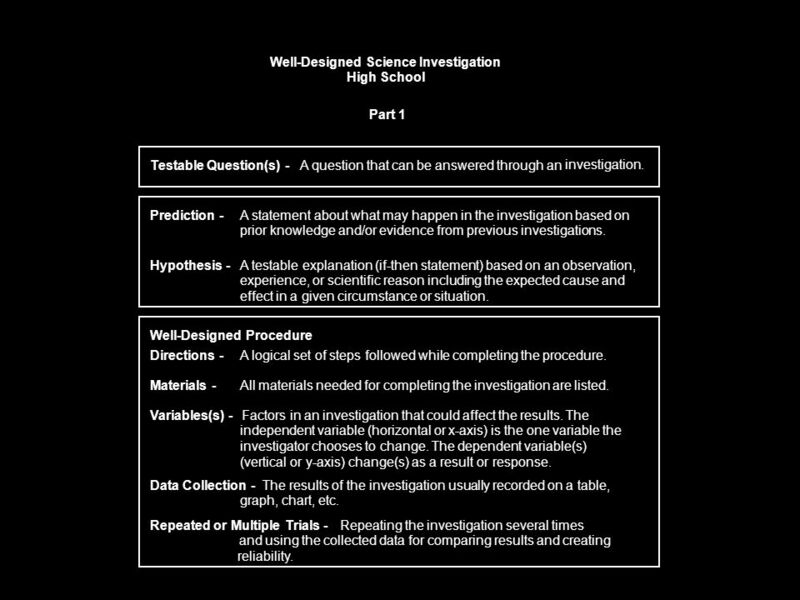 Variables(s) - Factors in an investigation that could affect the results. The independent variable (horizontal or x-axis) is the one variable the investigator chooses to change. The dependent variable(s) (vertical or y-axis) change(s) as a result or response. Data Collection - The results of the investigation usually recorded on a table, graph, chart, etc. Repeated or Multiple Trials - Repeating the investigation several times and using the collected data for comparing results and creating reliability. High School Part 2 Conclusion 1. A statement about the trend (general drift, tendency, or direction) of a set of data from analyzing the data collected during the investigation ( form a conclusion ). 2. The closing paragraph of a report including at least the investigative question, the hypothesis, and the explanation of the results ( write a conclusion ). Communicate and Discuss Results Share your findings with others for critical analysis (peer review, conference, presentation, etc.) 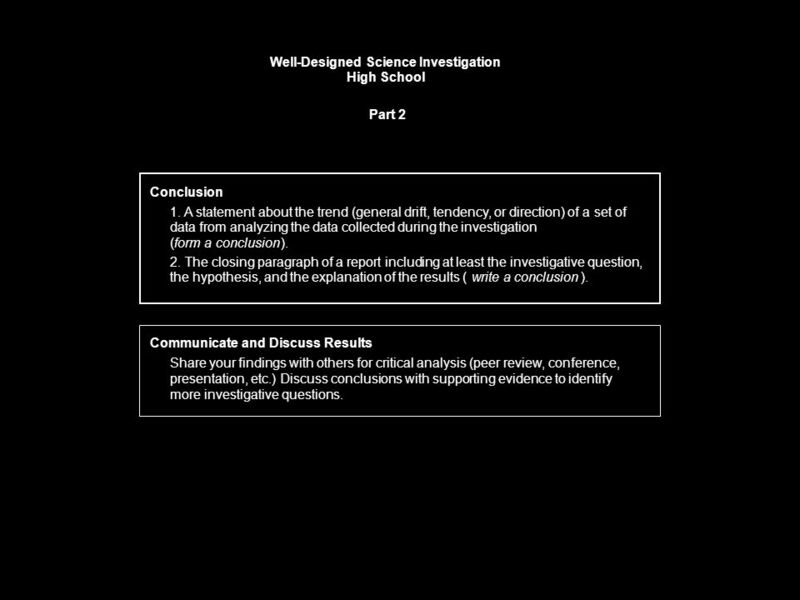 Discuss conclusions with supporting evidence to identify more investigative questions. Scientific Enquiry, Scientific Process or Problem Solving? 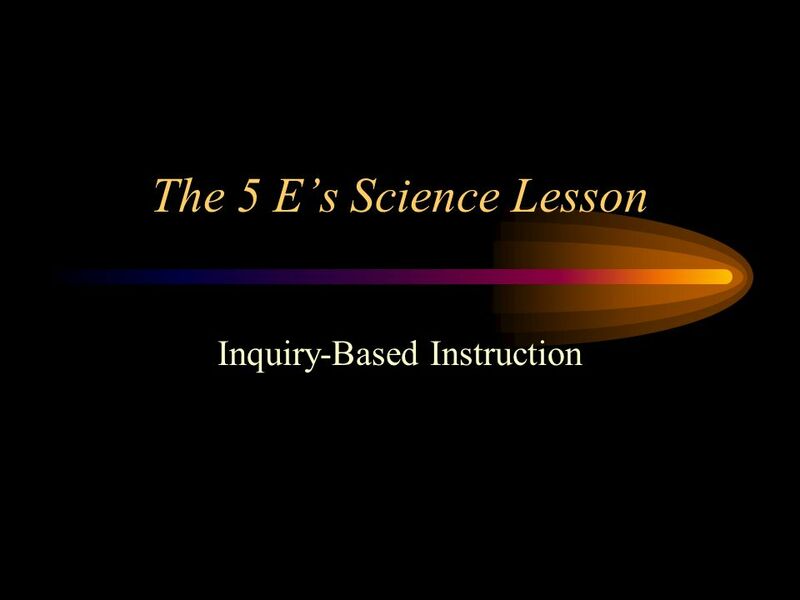 1 Friday May 26, Inquiry-Based Lessons in the Technology-Rich Classroom Essential Question: How can teachers incorporate inquiry into the lesson-design. Curriculum Instruction & Assessment Part I - Alignment By Tina Waddy. Planning for Inquiry The Learning Cycle. What do I want the students to know and understand? Take a few minutes to observe the system to be studied. What. Mind the Gap Seminar Hungary Doris Jorde University of Oslo. 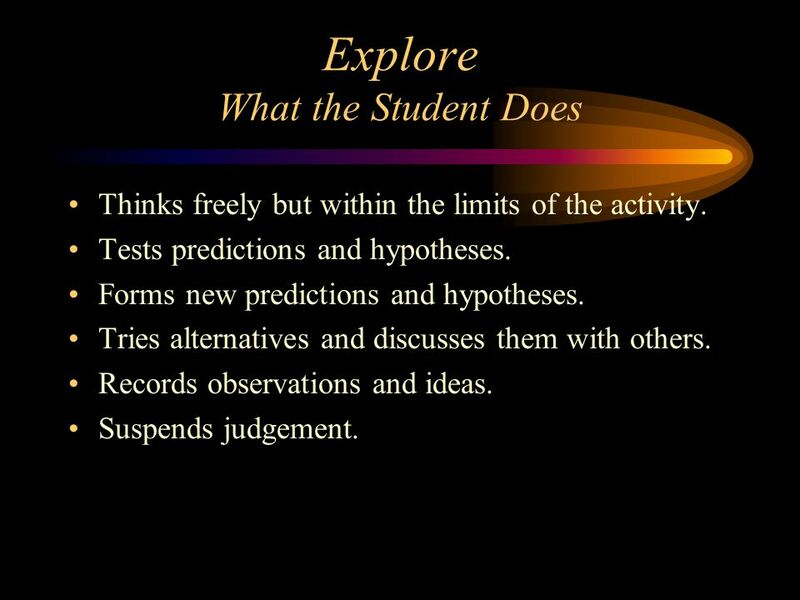 1.scientific method = approach taken to try to solve a problem, can include recognizing the problem, forming a hypothesis, testing the hypothesis, analyzing. Inquiry Based Learning Donna Barrett Center for Education Integrating Science, Mathematics and Computing.